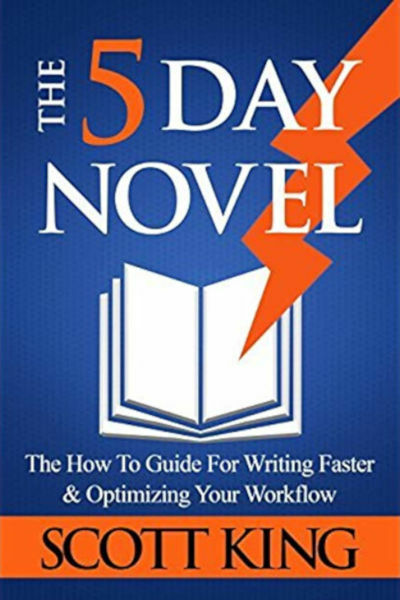 Want to plan, draft, and revise a novel in five days? That’s exactly what Scott King did. And, he outlined his journey in The Five Day Novel. Over the years, I’ve grown a small collection of writing books. Not many. Just enough to remind myself that I need to keep plugging away until I publish that first novel. I’ve made a vow to myself to read more about the craft from other authors, which is something I need to do on a more regular basis. After winning NaNoWriMo last year, I’ve become more interested in the topic of writing more words in less time. Every writer has their own process, but I think most of us want to be able to write faster if we can. That’s why The Five Day Novel appealed to me. I didn’t want to take on the challenge of writing a novel in five days, especially after having experienced how tough it was to write a novel-length work in thirty. I wanted some insight into how someone could punch out that many words in such a short time. The best part about the book was reading the author’s journey. After seeing his struggles, I thought, I’m right there with you, buddy. It’s no small feat to write 50,000 words in a month. It’s insanity to try it in two days, which was the time he took for the first draft (the other days were reserved for outlining and revising). I wouldn’t recommend such a feat for anyone but a seasoned genre author. The thing I’d really hoped for was more practical advice. While King did provide some good tips (e.g., turn off the Internet, have a soundtrack while writing, eat good, sleep well, and exercise), he didn’t bring anything new to the table. Most of the practical advice was what you’d find in any blog post from 100s of authors rehashed over the Web. It’s not that it was bad advice. These are good things for anyone to do in any creative endeavor. One of King’s focal points is that if you want to be a writer, then simply be a writer. And, that means you must actually write stuff. The book stands on its own well enough if you go into it simply wanting to follow King’s journey to writing a novel from start to finish in five days. But, don’t expect much more than that. If you’ve never written a novel and want to finish that first draft to get a feel for the process while learning about yourself as a writer, I recommend No Plot? No Problem! by Chris Baty instead. It has far more practical advice for getting over the humps in the process. And, it’s a pretty funny read at times. It’s helped me both times I attempted National Novel Writing Month with getting my word counts up.